Happy National Corn On The Cob Day! I think it’s a great idea for a holiday. I love corn on the cob. It is so delicious and summery! What, you may ask, does this have to do with Would You Read It? Well… as I see it… absolutely nothing 🙂 But I still think it’s important that you know the historic significance of the day! Now then, if you could all kindly stop comparing corn on the cob recipes and arguing over the exact number of seconds required to perfectly cook corn on the cob, we could get down to the business at hand! First, I’m thrilled to announce that the winner of the May Pitch Pick was Jason with his pitch for Barnabas Is NOT A Ninja!!! Congratulations, Jason! Your pitch has been sent to editor Erin Molta for her comments! And congratulations to our other brave pitchers who took the time to write, polish and perfect their pitches and summoned the nerve to put them out there for commentary. You are all winners in my book! Even if you didn’t win the pitch pick, you should still all have pitches that are worthy of telling famous editors you happen to meet in elevators. YES! 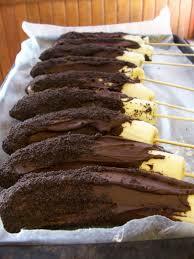 It IS chocolate-dipped corn on the cob!!! The Pitch: Ten-year-old Rhea’s growing sunflowers for Petal Path’s Magazine Contest. Her Dad lost his job, and the prize money would help her family. But to win she’s got to find something new to share about her sunflowers. A goldfinch thinks he can help. Together they mysteriously time-travel through one of her sunflowers. They eventually arrive in Past Times, where a new gardener needs help with his own garden woes. There she also has to conquer squirrel antics and deal with a rambunctious raven. Will she solve her sunflower problem, or get back home in time to enter the contest and help her family? Please send YOUR pitches for the coming weeks! For rules and where to submit, click on this link Would You Read It or on the Would You Read It tab in the bar above. There are openings in October so you’ve got a little time to polish up your pitches and send yours for your chance to be read by editor Erin Molta! Michelle is looking forward to your thoughts on her pitch! I am looking forward to sampling some chocolate-dipped corn on the cob 🙂 Just for kicks, we should take an informal poll: would YOU be willing to try chocolate-dipped corn on the cob?